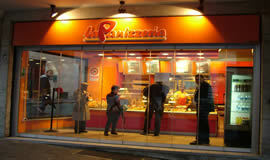 More and more bakeries are choosing the Giemme System folding glass doors as the external shop window display. We try to understand the reasons why many managers are making this choice. Firstly, the effect of an “all glass” window is what catches the eye of the passer-by and being able to see the goods offered inside the shop with ease is an irresistible invitation to enter. During the summer months when the doors are completely open besides ending the barrier between outside and inside, the smell of freshly baked bread fills the air attracting passers-by. During peak hours when the shop is full of people, even during the colder seasons, the doors can be partially or fully opened to ventilate the room and thus allowing people to wait more comfortably. 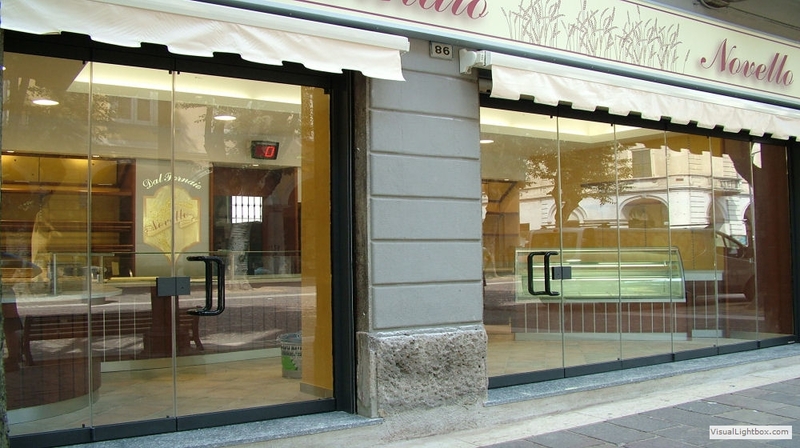 Among the solutions that we usually recommend is that of the Bakery in Saronno: a hinged door on one side (perhaps complete with lock, handle and door closer) and the remaining doors folded up on the other side with a recessed floor guide rail. 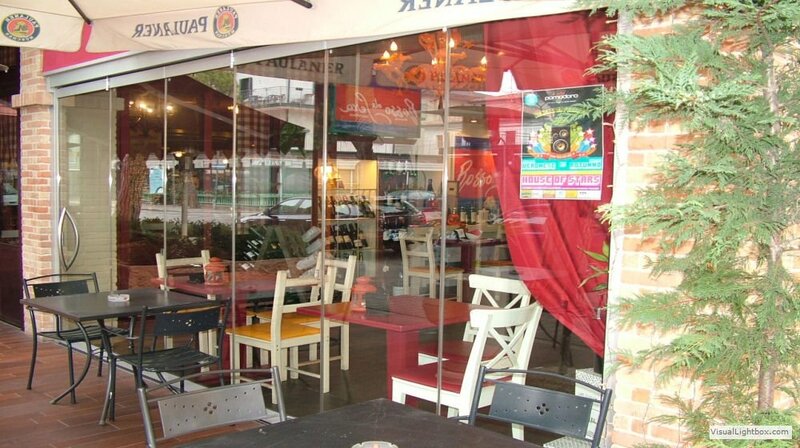 If there are no more than 4 doors, the Giemme System can be installed without a floor guide rail, like at "the Panizzeria” in Rimini (photos show the doors both open and closed). 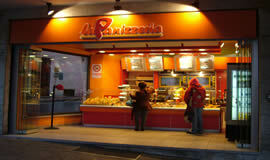 For its larger premises, “the Panizzeria” bakery chain prefers the centrally opening solution reduced to a minimum with handle and lock. 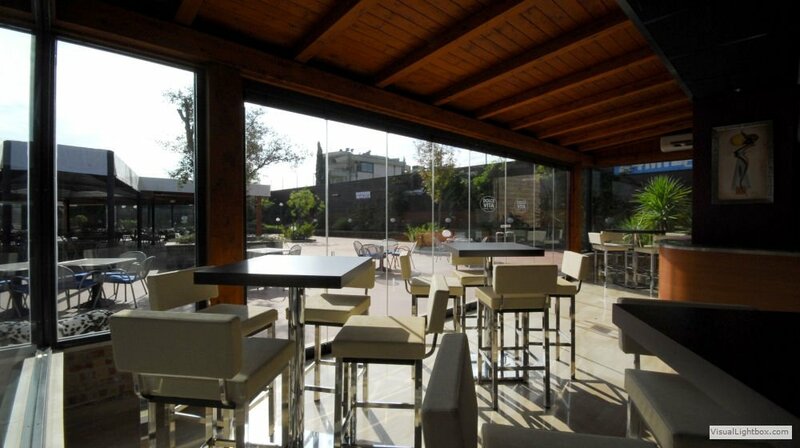 See the example of a bakery with 10 folding doors in Vicenza. Doors fold up to the mounted side. Also available without a floor guide rail up to a maximum of 4 doors. Entrance door with lock, handle and door closer. Can be opened internally or externally. With hinged entrance door. Doors can be folded up also at the entrance door side. Doors can be folded up to either side. Only available with a recessed floor guide rail. Entrance door comes with handle, lock and door closer. Can be opened internally or externally. 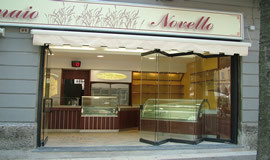 3D is another classic solution for shops and bakeries: with a transom window (that can be fixed or opened). There is also a hinged door with a handle and lock.